Everyday, Tenali Rama and the king went for their evening walk. 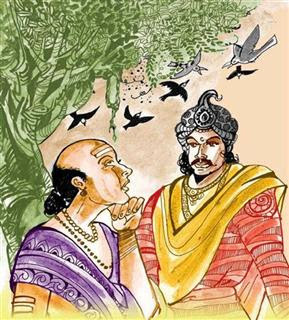 Ram Krishna was telling the King about various plants and flowers. There were a lot of crows around. Theys were making a lot of noise. ‘It is difficult to say,’ answered Ram Krishna. ‘Nothing is difficult if one decides to do it. I will give you a week. You have to get the exact number of crows in our country,’ ordered the king. Rama Krishna was a worried man. ‘How can one count the number of crows?’ he thought. He could not sleep. Days passed by and still Rama Krishna had no answer. He did not know what to do. ‘What’s that?’ asked the king. The king appreciated Rama Krishna’s diplomatic answer and rewarded him. 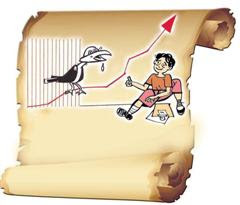 A calculation without a basis is called ‘crow count’. Is it possible to have a census for birds and animals like the human census? Has anyone tried to do that? Do we know how many varieties of animals and birds exist on earth? At present lots of efforts are being made worldwide to assess the number of birds and animals. The forest department is in the process of counting the number of lions and tigers in the forest. These numbers will help us serve the animals better and assess the status of the environment. The forest department often keeps advertising for volunteers to help in the counting of lions and tigers in our forest. If it’s possible, you can also take part in it. Telugu Books Free by Vikasa Dhatri.